It was a big day for the both the nations. The meeting of AmericanPresidentt Donald Trump and Indian Prime Minister Narendra Modi is one of the most awaited events of this year. Expecting various favorable reforms and positive takes, people from both the countries are expecting some fruitful outcomes which might assist the country people in aspects of jobs and opportunities. Twitter was very much ideal proof that popped the importance of the meeting, with a hashtag #ModiTrumpMeet, the pictures and speeches of both the leaders went viral on social media. This hashtag trended the whole day. Surprisingly, Narendra Modi is the first leader to be invited to the White House, had a one-on-one interaction with the President, the due also held a joint conference for the media post interaction, which somehow appeared to leave some positive impacts in the angles of people’s favor. Later to this, Modi was given a grand red carpet welcome on Monday. Trump and First Lady Melania Trump were waiting to greet him at the White House. Despite this much respectful addressing and mutual conduct, a shot video of the event is going viral on the Internet, and you can’t miss it. 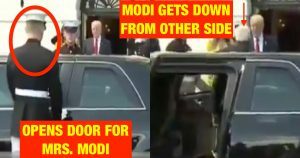 In the video one can see what happened when the car of Prime Minister arrived at the White House, the guard on the other side opened the door for his wife but is left hanging as he there’s no one apart from Mr. Modi himself who already came out from the other door. This must already have coated much embarrassment to the guards, they would have been safe only if they had known that Modi travels alone, everywhere.